Celebrated Art Deco architect Henry Hohauser was born in New York (Brooklyn?) on May 27, 1895. He studied at the Pratt Institute in Brooklyn before moving to Florida in 1932, where he was able to create a successful practice even during the Great Depression. His work include hotels, theaters, apartments and houses built simply and affordably and aimed at middle class budgets - especially of tourists. He designed more than 300 buildings, many of which today are part of the Miami Beach Art Deco Historic District. Before there was Las Vegas there was Henry Hohauser's Miami Beach. 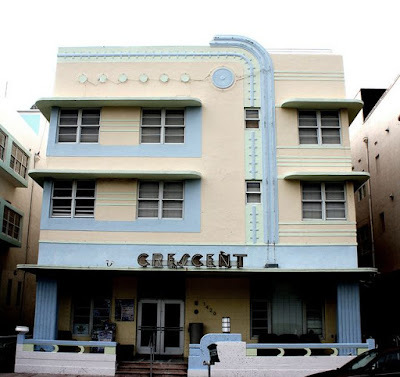 He was member of Congregation Beth Jacob on Miami Beach and built their synagogue extension in 1932 which today houses the Jewish Museum of Florida. Hohauser's career created the model for many other Jewish architects (often from New York like Morris Lapidus) who found work and reputations in South Florida in the post-World War II period. Besides Beth Jacob, some of Hohauser's best known buildings are the Carlton,Essex House, Beachcomber, Congress, Crescent, and Cardozo hotels. Henry Hohauser died in Lawrence, New York in 1963. Miami Beach, Fl. 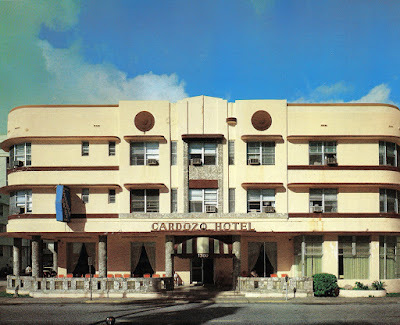 Cardozo Hotel, 1300 Ocean Drive. Henry Hohauser, arch., 1939. 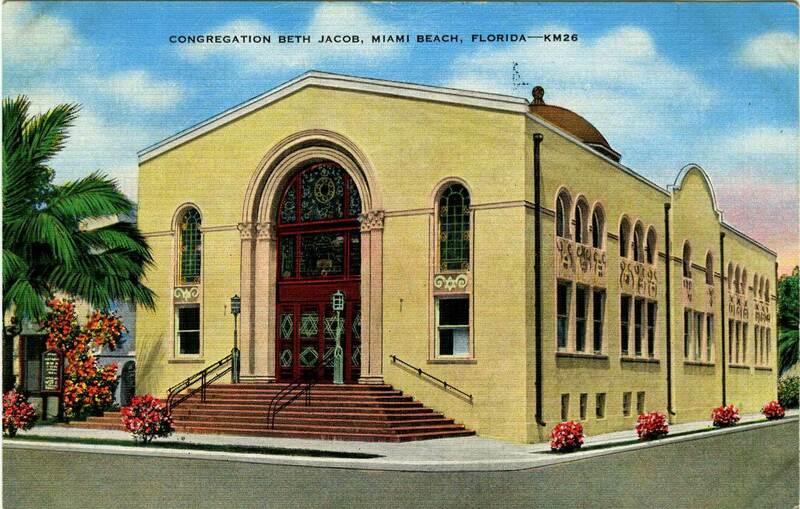 "Congregation Beth Jacob (founded 1927) was the first Jewish congregation in Miami Beach to erect a synagogue in 1929 at 311 Washington Avenue. 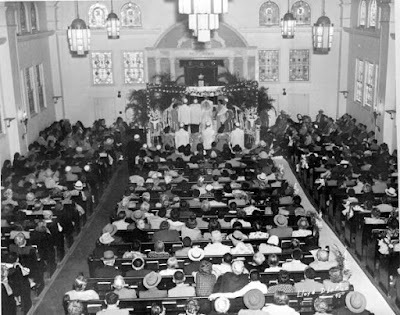 As the congregation expanded in the 1930s, a new, larger building was built (1936), next door at 301 Washington, designed by congregation member and noted Art Deco architect Henry Hohauser. We think that the synagogue was Hohauser's first project on Miami Beach. 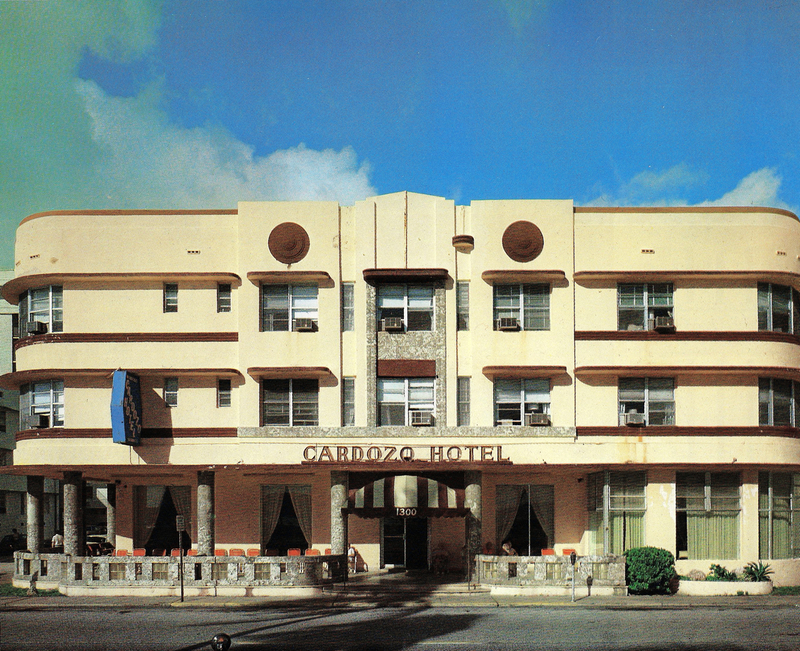 Hohauser was responsible for the design of more than 100 Streamline Moderne-styled hotels, apartments, and other structures on Miami Beach in the 1930s and 40s. Miami Beach, Fl. Congregation Beth Jacob new sanctuary (1932). Henry Hohauser, architect. Wedding. Photo: Jewish Museum of Florida. Miami Beach, Fl. Congregation Beth Jacob new sanctuary (1932). Henry Hohauser, architect. Sanctuary when first established as museum. photo: ISJM (ca. 1997). 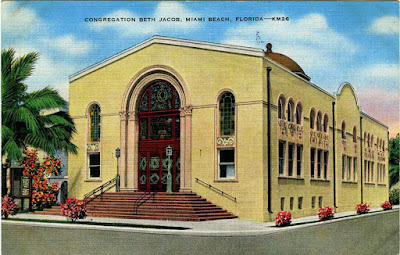 The Museum's primary building (301) was erected in 1936 as the second sanctuary for Miami Beach's first Jewish congregation (Orthodox). This structure boasts 77 colorful stained glass windows, eight Art Deco chandeliers, marble bimah, decorative exterior concrete relief panels and a copper Moorish dome. In its original configuration, the building held 850 people in theater-style seating with a women's balcony. The floor was sloped to allow worshippers to see and hear the religious services. The structure was built at a cost of $40,000 with the same elements and materials as the adjacent original synagogue that was built seven years earlier. The front elevations of both buildings have the same gable and two-story rectangular plans. The central double door of 301 Washington Avenue has inset panels, highlighting the Star of David. The main entrance is elevated by ten steps surfaced in tile and is approached from three sides. Above the door is a large arched stained glass window that represents the giving of the Ten Commandments to the Jews on Mount Sinai with the rays of the Divine presence streaming down from the clouds. The entrance is flanked by coupled fluted pilasters of cast stone, topped by composite capitals with the fluting continuing in the arch. The original light fixtures and stair railings remain. Multi-color Art Deco friezes with the Star of David are located between the first and second floor windows on all four sides of the building. A copper dome mounted in an octagonal drum crowns the outside of the building. Each side of the drum has an octagonal stained glass window with a central Star of David. The rear elevation is a symmetrical composition with windows flanking the central projecting beam. Above, a stained glass window depicts the Menorah. The interior ceiling is a shallow barrel vault with seven Deco chandeliers and another larger chandelier suspended from the top of the copper dome. Six arches in the ceiling connect twelve columns on the northern and southern walls. The columns contain the Star of David and Menorah-like sconces. When the structure was built, it had no air conditioning. The transparent glass windows had to be opened during services, letting in the street noises and the beach's blowing sand and dust. 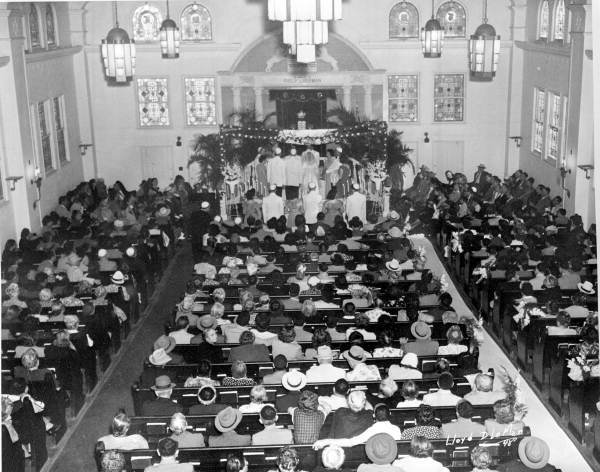 When Rabbi Moses Mescheloff (spiritual leader 1937-1955) addressed the congregation with the windows and doors open, he had to speak so loudly that he could be heard a block away. The sun shone so brightly that it was impossible for the worshippers to read their prayer books. The solution was determined as installing stained glass windows that were designed by Rabbi Mescheloff with graphic symbols to proclaim the messages of the foundations of Judaism. They create an environment beautifully enriched with the aspirations of the principles of the Jewish faith. The stained glass windows, installed in 1940, were fabricated in Hialeah.